Here's WIP so far. I had to duplicate my caribou in the end as it was easier to move them so they weren't so regimented. But I have to duplicated the "walkers" up on the hills who are just coming down to the river and thought I can replicate them. They are objects now. When I try to replicate... and I do select the item in the Model room, nothing happens... Car just freezes. Didn't do that before, but maybe I was doing .car caribou models vs objects. What am I doing wrong...wanted to do some replicating to meet the rules. Have lighted each group separately. I know once I put in background and sky all will have to be re-tuned, but was going for a dawn hunt scene. Also...I have to paint some more blood around. I don't want to do it on the rock where the hunters are or it will reproduce on all other surfaces as I have consolidated shaders. So I am thinking to make a little rug/mat and put some runny drippy blood on it. Or can I use water drops from Basic Particles? ETA Yikes... need to reduce telephoto....it mucks up the depth of field...the distant caribou look too close! Will repost photo. FYI, you can add morphs to such a replicator mold, and whatever is replicated onto it will move along with the change in the morph. I'll have to see how you did it, never got around with playing with the clouds, i did a quick look when i first got it. 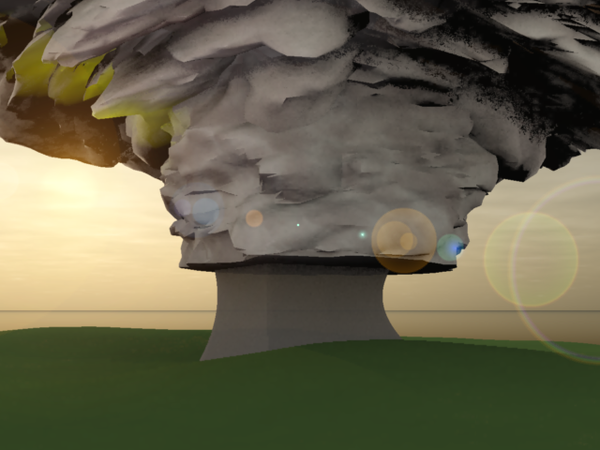 i use the tree blocks in everything outside that i need with background trees, they look good, load fast and render fast too. That looks very nice! The model I linked to uses a cellular function along with curved filter in the displacement channel to get the cotton ball look you've got there. If you use your shader there, you may get a similar effect. I downloaded it haven't had a chance to look at it yet, there was a thunderhead one also i grabbed to look at. 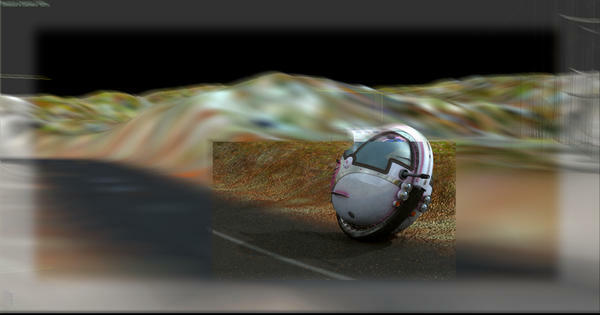 I'll have to run my bump map as a displacement map. I never had luck using displacements, they slowed my machine way down, I've since upgraded so I'll see what it can do now. Do you have Phtotshop or some other image editor that can handle layers and masks? Sure. But it would be better, I think, (at least in Carrara) to create a blurry, rainy shader. 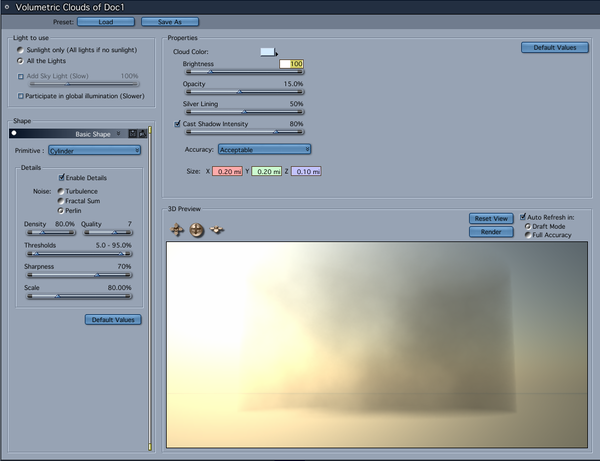 I often use Volumetric clouds with special settings to blur things. Carraras blur post effect might not getyou where you want to be... but why not try it. Select the object and go to the Effects tab. It'll still need shader work though. ...wanted to do some replicating to meet the rules. Just to be clear, you have to either customize a terrain or customize a use of a replicator. You don't have to do both. The two do often go together, though. Hope you get the blood sorted out. Could you use black in the alpha channel of a simple plane to mimic streak of blood? Oh thanks Dio for clearing that up...makes life easier! EP... thanks for the PS idea and you as well Dio, I can make layers and lay drips/blobs in various places. I want to get the scene back to its right focus first. kashyyyk ..... I love your tornado-like cloud...wow! For the first time I am working in a large scene. Usually I just scroll in to get to a distant object but I seem to have gotten lazy and starting using the telephoto of my main camera to dive in to the background. DOH? I should have made a separate camera side by side for that. Then after fiddling with something in the background, I could switch to the main camera and be back to normal panning. This didn't stick out to me like it does with photos... I have a great photo of an old cottage our family had in a harbour. The bridge was at least two miles away, but when I went down the road to get the cottage and the bridge in, I cranked up the zoom. Made a nice photo, but 40 years later I had someone do a watercolour of the photo for my brother's birthday and the first thing we both said was YIKES...the bridge was never that close to the cottage. So I should have known better. Fixing now. Will make blood as well and post later. I still haven't done the background and sky yet. 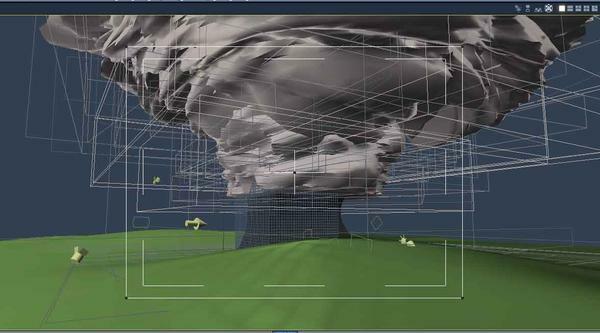 You can still add as many cameras you need to your scene. Add a conical camera, then switch to that camera, then where you pick your camera use the 'set to...' and move that camera to any other camera, position or directer's camera, you can even save positions and use them over and over. This looks like it's going to bee an interesting challenge. Lots of good ideas and wip's so far. I'm late in entering, but I did start sketching something, the same day that the theme was announced. But then my computer stopped working. So I had to replace my graphic card, installed a new harddrive, and upgraded to Windows 8.1. So I finally manage to get my programs up and running, except the Content Manager System. Here is my racer. It's being created in Hexagon, and I hope to rig it. 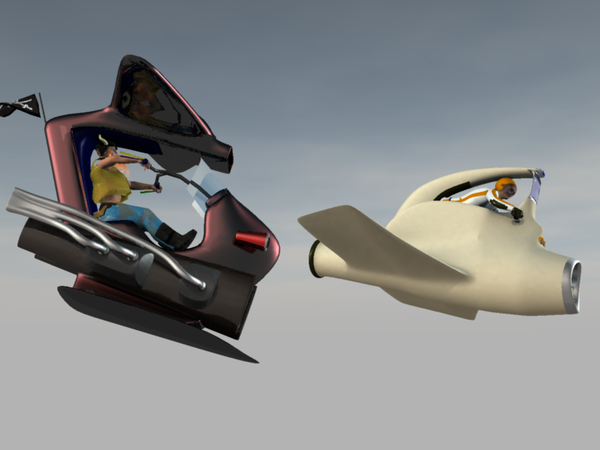 A basic "Good vs Bad" race, destined for an anim, so I'll take a still from that for the entry. I will try to make a simple part of it in the Carrara VM, OH VEY! Emmmm OK....is that a mechanical bull under construction??? Sorry... since my scene fell apart I am a bit prone to black humour at at the moment! I figured the cloud itself would be a bit bright for what you were doing. Since you were using a mesh, I figured you may want to look at one that works well to see the technique. I was impressed with. As Dart suggested, there's a blur post effect you could use, but as he also suggested, the shaders could use some work. I'm thinking you'll want to use some form of alpha or transparency. 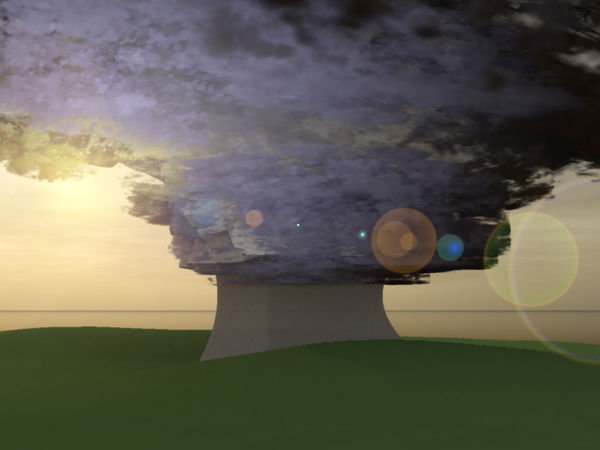 Another possibility is that there are some volumetric cloud types that you can constrain to shapes, such as cubes, cylinders etc. You can also define the amount of fill and fall-off. I'll see what I can work up. I don't feel like working on my scene tonight as I'm pretty tired and it needs some deep thoughts on how to proceed. Here's my attempt at the rain beneath a storm cloud. 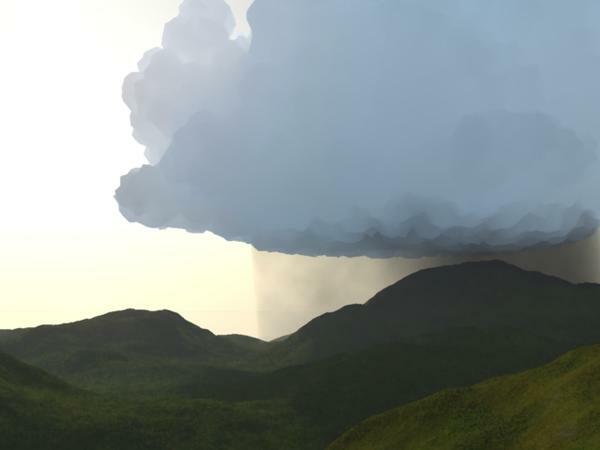 I used a cylinder shaped volumetric cloud for the rain. The storm cloud is the one I linked to a few posts back, just for the sake of convenience. I'm including a screen shot of the cloud settings. Very nice, I'm calling it quits for the night, can't wait to give this a go tomorrow! Next portion of my WIP - the gorge down which they'll be racing. 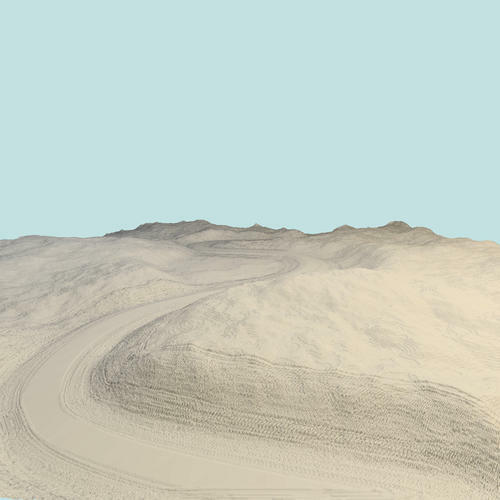 Technical stuff - The terrain was made in Carrara from a height-map custom-painted in Bryce. Added fractal filter for cragginess. The trees are all Xfrog billboards. Those along the cliff-top replicated on a plain, those along the river banks replicated using a distribution map. 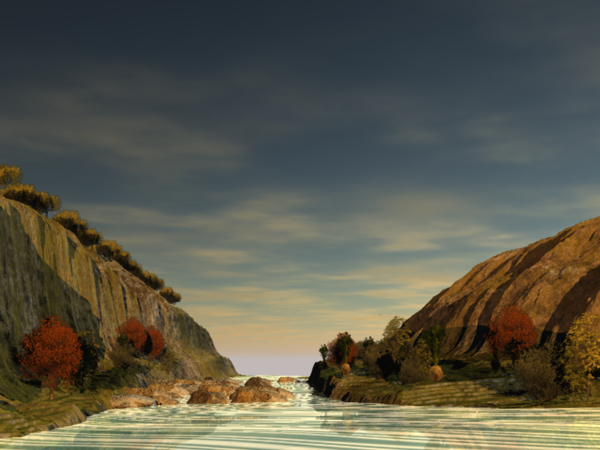 The rocks in the river were made in Carrara VM and replicated on a plain. @Roygee - that is going to be fantastic. Thanks for turning me on to the Bryce heightmap editor (in the thread on railroads). Just think how much we could learn if more of the friendly Bryce folks were to bring their terrains into Carrara and meet the challenge requirements by using a replicator, or by any of the many other ways to customize a terrain or replicator. 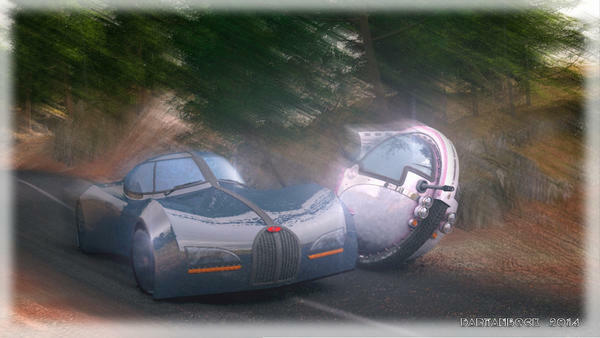 This movie was the inspiration for Hanna-Barbera's Wacky Races and has been an inspiration for others series, movies, etc. Thanks Jay. Set your recorders, everyone. 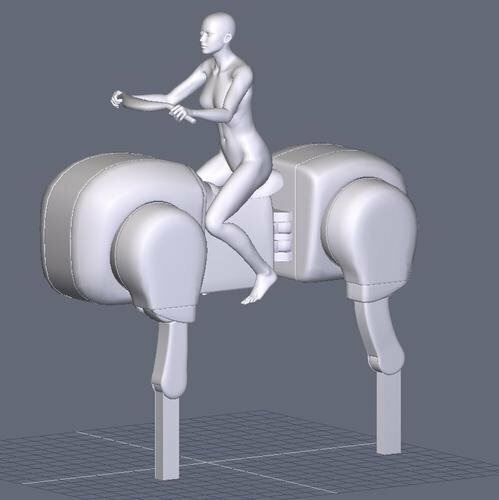 So far, I don't think I've seen a WIP based on The Great Race movie. Maybe it is too obvious? Here is a WIP for my "don't fence me in" entry. I have a fence now (vertex model, duplicated), so that is progress. I also have a Spanish mission, because why not? It is just the Alamo from the Carrara object browser. The cluster of tress near the end of the fence have been placed there. I customized the silver maple by extending the trunk and spreading the branches out more. That is my image of the trees that are on the great plains. The trees along the stream banks are placed with a replicator. Making slow progress on the cattle because the details of the herd will in part depend on how I handle the scrub grass. I have been experimenting with replicating grass vertex models, and with using hair. I'm not satisfied with my results with either yet. I had pretty good results using hair as the scrub grass when I lowered the camera, but then I lost sight of the stream bed. Come for the race... Stay for the pie fight. Your WIP is looking good - reminds me of the vast empty spaces with lonely farmhouses miles from nowhere in our Karoo region. Beautiful in their desolation! Make no error, Carrara is capable of making really good terrains, but no-one seems to use them for much else than backgrounds. 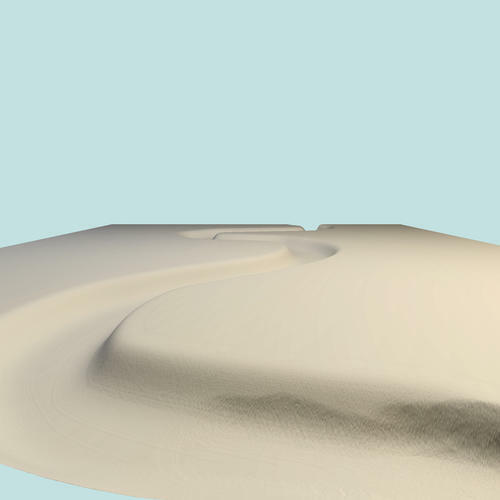 I needed a very specific type of terrain, which is why I used Bryce - it has such a good heightmap editor that is easy to use to design a custom terrain. It's great to see the works being produced here by everyone taking part. And lots of lessons for the rest of us. 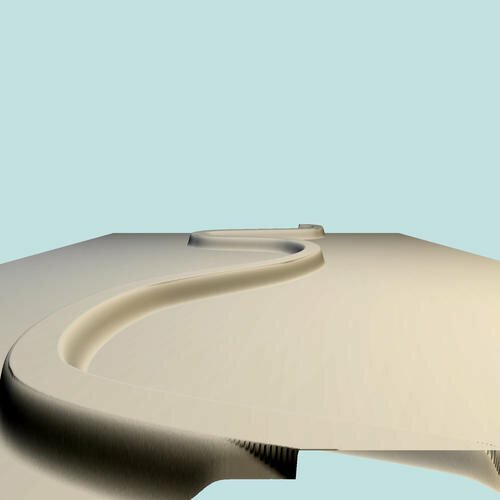 Using various layer of height maps to achieve more specific control, and it works! 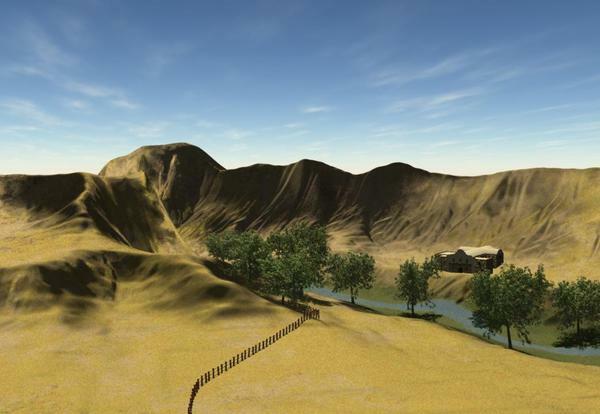 Some Test shots and the height maps loaded into 3D Designer of Howler, to show what each map does by itself. Wow, Yeah! Very cool Roygee! Man, I still haven't even messed with Bryce, yet it looks so cool. Thanks for the reminder that we can truly use it to enhance our Carrara work. Bravo! Here is a WIP for my "don't fence me in" entry. Everybody's stuff is looking pretty sweet as well. I had no idea that we could layer multiple height maps on top of one another. This adds an enormous amount of flexibility, as we can set the specifics for each map separately. Need to knock out some more pointy thingies? Make another nice, smooth map of the path you need, and put it in with whatever height is needed to create the effect. I'm loving this!